The area within the embryology laboratory for procedures such as assisted fertilization (eg., ICSI) or assisted hatching contains very specialized equipment. 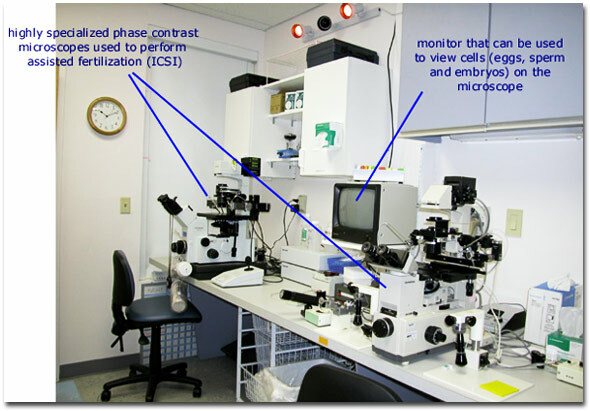 Phase contrast microscopes are especially useful for examining transparent microscopic material such as living or unstained cells (eg., eggs or embryos in culture). A number of highly specialized accessories for these microscopes allows the embryologist to hold and manipulate the eggs and embryos. The success of an IVF program relies heavily on the quality and skill of the embryologists. The embryologist needs to reconstruct the physiologic environment of the fallopian tube (where fertilization and early embryo development normally occurs) so that fertilization and early development “in vitro” (within the laboratory) results in healthy viable embryos.